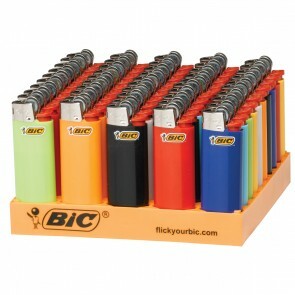 Get 150 BIC Lighters and a 3-tier BIC Wood Display. Showcase your BIC lighters with this beatiful wooden display and save counter space! This Display Case features 150 lighters, which includes 50 solid color, 50 solid color minis, and 50 novelty design. Flick your BIC! • 150 BIC lighters Total. 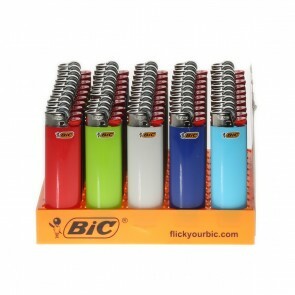 The Original BIC lighter is widely known as the most reliable disposable lighter on the market. BIC lighters fit perfectly in your hand and are easy to sell as the most trusted lighter in the world. The Original BIC Mini lighter is one of the most reliable disposable lighters on the market. BIC lighters fit perfectly in your hand and are easy to sell as the most trusted lighter in the world. Get your Bob Marley Curve Series lighter! Stylish in its design and shape, this lighter pays tribute to the iconic Bob Marley.